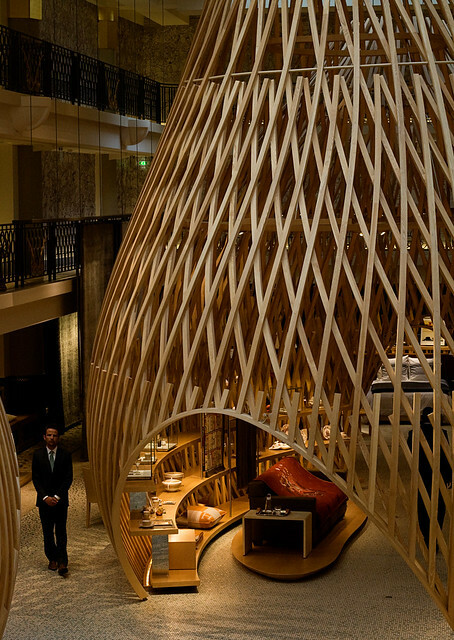 My friend, lauraloo reminded me to visit the Hermes store at St Germain des Pres. I'm glad I did because the interior of the store is a work of art. I barely paid attention to bags or scarves on display. 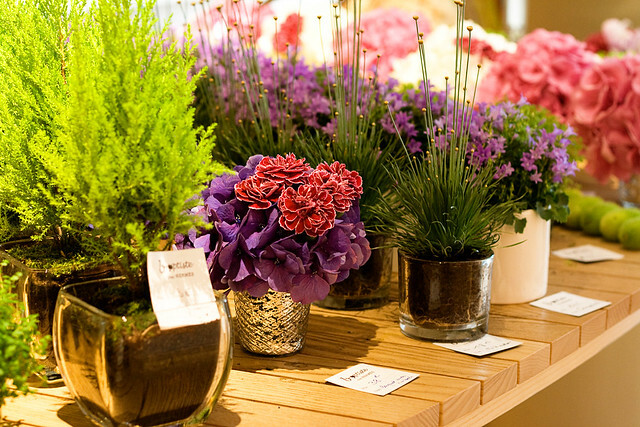 There's a floral store as you enter and a cafe on the first floor. The store is spacious and rather quiet compared to their flagship boutique at rue Faubourg St Honore which felt like a market. In fact, I wasn't overly impressed with the latter store. It was crowded and hot. Given that I arrived an hour before closing time, I will make a little concession for the poor customer service. The three weary and disinterested sales associates I had the misfortune to deal with had spent better part of the day saying no to every customer's request. Before I even finished my sentence which was if they could show me a few examples of messenger style bags, they'd already said no. One tried to avoid eye contact so she didn't have to serve any customers. We were wandering around the Republique area near our apartment when hubby spotted a store with the words New Zealand on it. The poor guy has been missing home so much that anything that has a minute connection to the country makes him want to break into a song. Before I even blinked, he'd already dashed into the store despite knowing they only sell women's clothing. 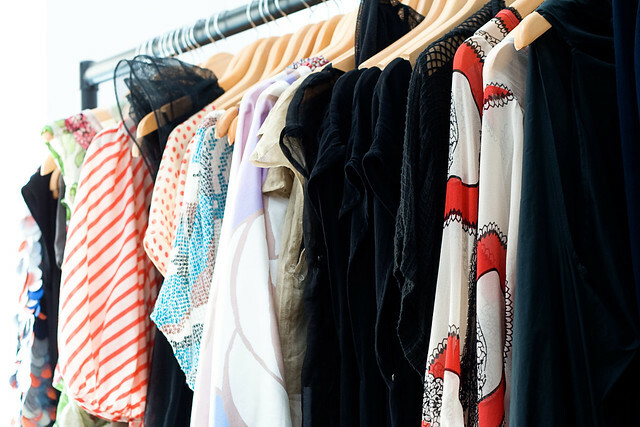 Catherine is the owner of Koko boutique that stocks only New Zealand designer labels such as Trelise Cooper, Kate Sylvester and my personal favorite, Karen Walker. 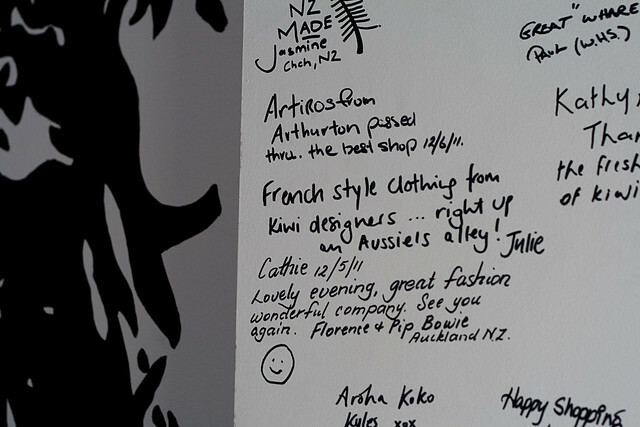 Every visitor is invited to autograph her wall. One of my favorite shops in Paris would have to be Fragonard, a perfumery that sells a menagerie of products which include toiletries, printed tunics, souvenirs and scarves. Their merchandise is very affordable with beautiful shawls priced at a mere 40€. There is so much to see at the store and plenty of perfumes to try out. I must warn you though, walking into their store is an unforgettable olfactory experience. 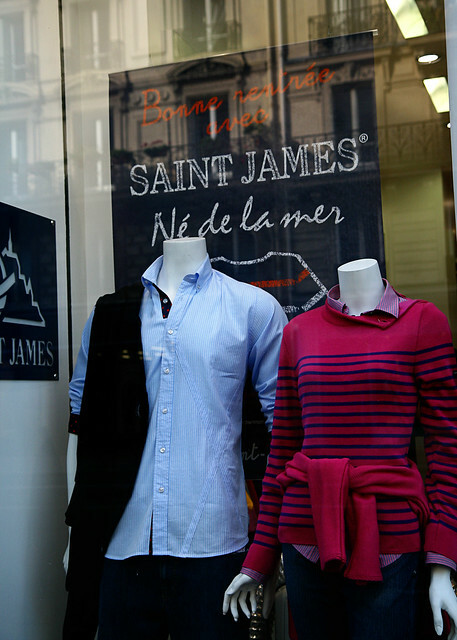 St James Breton tops are quintessentially French. In fact, I would say these famous nautical striped tops and sweaters are not only part of their daily uniform, they've permeated into every fashionista's wardrobe all around the world. I've only just "discovered" Cotelac but boy, did I fall in love in a swoop. Their clothes are beautiful beyond words. They'vre very typical of French fashion where they're able to combine both classic designs into something really edgy and very wearable. Prices aren't cheap with dresses ranging from 185€ upwards. Cotelac has a few stores in the US and even as far as Taiwan but unfortunately, none in the UK. 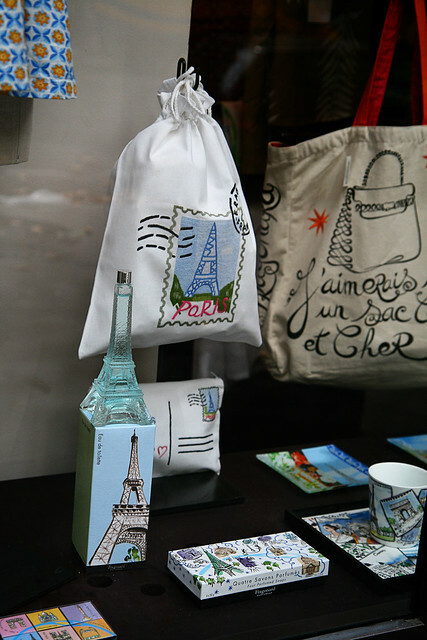 Any concessionary store or Celine stockists in Paris must've received a big shipment of Celine Luggage totes when we were there. There was a gamut of choices in terms of color and the different styles of the Luggage totes. The medium sized totes were 1220€ which I think is value for money. I had a chance to examine the bags inside out. The leather is divine and one can't fault the impeccable workmanship. 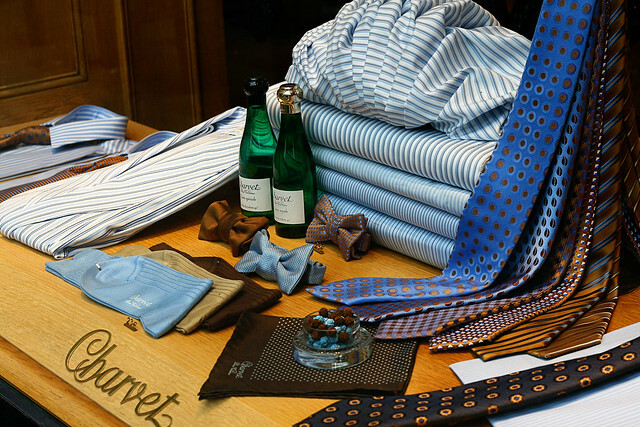 Hubby has been dying to visit Charvet, THE ultimate shirtmaker based at Place Vendome. The Rolls Royce of all cars. Hermes Birkins..... okay, you get the idea. This is THE shirtmaker for the French presidents, political leaders, celebrities and so forth. In fact, Naomi Campbell custom orders men's pyjamas for herself. We were lucky to meet Xavier, a kind and personable gentleman who took us around the store despite knowing that no, we won't be walking out of the store with a 550€ shirt. It was an eye opening experience indeed. There were well over 5000 different fabrics, 15 different collars and God knows how many choices of cuffs one can choose from. Xavier had just returned from Sydney, Australia after 22 years there. It was a revelation talking to someone with similar experiences of juggling between two different continents half a world away. I strongly urge you to visit Charvet if you have a chance and do ask for Xavier. When in Rome, do as the Romans do. When in France....... wear French clothes. 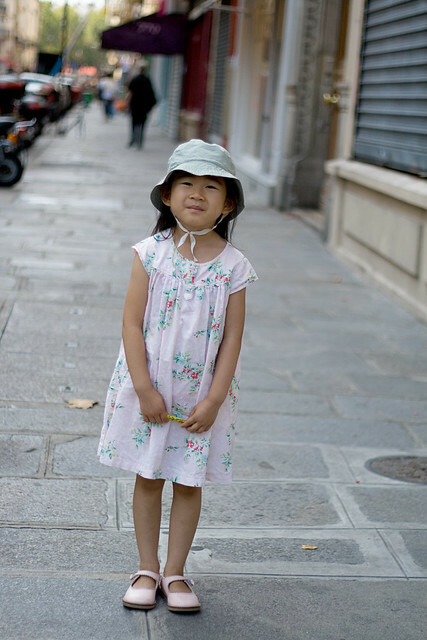 Little L's daily outfits are from Petit Bateau and Catimini, two popular childrenswear labels in France. aw, Little L is so adorable!! As always, great post! Hi! Thanks for that tour...it gave me a mini vacation right from my living room! Hope you stop by to say hi! I love these shopping posts. I'm sorry to hear of your snobby experience at Hermes, although, it's not the first time that i've heard that. 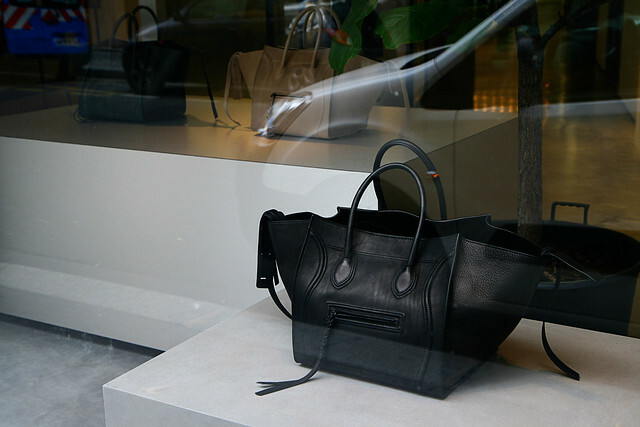 The Celine bags looked divine, definitely on my wish list and your little girl is so adorable- tres chic! Rue Charlot is where I lived for a year! I love, love that district--so I'll be on the hunt for this friendly shop. And my first truly loved perfume was from Fragonard, so I have a soft sport for their store. In other words, I love your list and can't wait to follow your lead! Divine! I missed some of these places when I went - I guess I'll just have to go back!! Love your latest posts, thanks for sharing! Black is the new black - Thank you! Sharon, thank you for dropping by! I'm glad you've enjoyed the tour. Sharon (MMC), I've been to the FSH store a number of times but have never been impressed with their customer service. I guess I must have picked the wrong SAs. The taupe Celine I saw at Printemps was divine! Thank you for the lovely compliment about Little L.
Kat, I'm glad the post was helpful. I guess the best time to go is first thing in the morning. StefPatt, Lil L will be thrilled if I read out all the lovely comments about her. Xavier is a gem. In future I might stick to the smaller H stores in Paris. Mi, I'll get her to call you on the phone later this week. Lauraloo, this is the perfect excuse to make ANOTHER trip back to Paris. Mona P, so glad you like the posts. Thank you for visiting. Thanks for sharing these shopping posts. 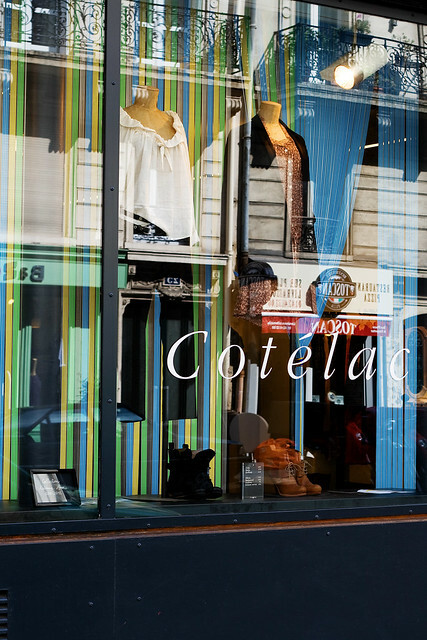 I'll try out Cotelac next time I'm in France. By the way, I love, love, love Catimini children's clothes. We bought tons from the winter collection this year for Sophie. It's not difficult to go crazy and buy a truckload of clothes for girls. Cotelac is amazing. 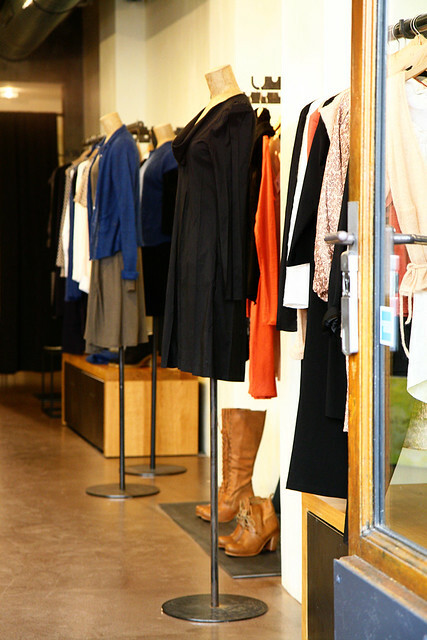 Iro is another store I'll visit again when I go back to Paris.